Yesterday some sad news hit me with Google’s decision to close Google Reader on July 1, 2013. Why? 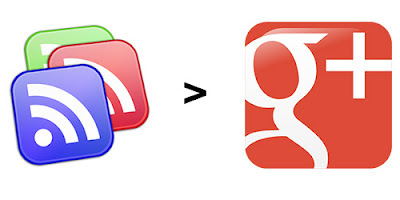 As The Next Web wrote, Former Google Reader product manager confirms our suspicions: Its demise is all about Google+. See Brian Shih, former Google Reader Product Manager’s answer on Quora. This is sad for me because other than Gmail and Search itself, Google Reader (GR) is the service I use the most from Google, and is a browser tab I always have open. I did write a post years ago my favorite Web App is Google Reader. You could say that GR is my gateway to the Internet! As much as I like Google Plus, it’s no Google Reader in terms of importance for my daily reading. It syncs my read items as a web-based RSS Reader. I use multiple devices, so having a central place is key. This is why I don’t care for fat/local client apps. I have the choice to socially share an item to a Facebook, Twitter, and G+. It’s not socially driven by default. I have no idea how I’m going to keep up with a mess of streams on social networks I already listed. It’s simple. I know what websites I like, there’s not many, but I do like to at least skim the headlines every day. That’s right, EVERY SINGLE DAY. My Reader Trends screenshot shows I have read 300,000-plus items! Although I’m pretty sure I used Reader since maybe 2007 or so. In short, it makes me feel that no Google service is safe from being shutdown. I use Blogger, which is also owned by Google, as my blogging engine. But are they one day going to take it down in favor of Google Plus? Should I switch to some other blogging platform in anticipation that G+ is going to swallow everything else that is Google? Google’s axed other services that I didn’t care for much, such as Google Wave and Google Buzz. But those services were short-lived and never got much traction to begin with. They never housed so much useful data for me, and maybe most anyone. Are we to believe that Twitter feeds and G+ posts are a good replacement to RSS? I certainly don’t think so. The social web is certainly great, but not everything needs to be social or curated material. This is especially true when your social network doesn’t even cover the material you’re interested in! The point of RSS feeds is for me to go over the content on my own time and speed. With the large fire-hose stream of material from social networks, I just don’t bother to even skim over the thousands of tweets/posts from a mere eight hours ago. It’s just not feasible as it’s more suited for real-time or rather, recent-time. 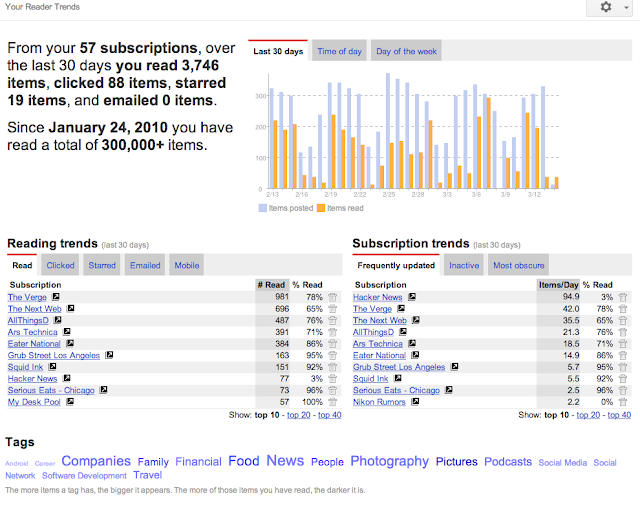 As Mike Elgan points out, Google Reader is used by tech-journalists and bloggers. These are the people that generate content that social networks share with each other! If GR is also the gateway to the Internet more so than social networks– it’s going to have a dramatic change in workflow. Thankfully, Google is giving the option to download your stuff via Google Takeout. I’ll be sure to do that before the end. As my Facebook friends have pointed out, there’s a petition to keep Google Reader Running on Change.org. I’ve signed it, but I doubt it will do anything. On reddit, there’s a nice AskReddit thread: What are some good web RSS readers to replace google reader?